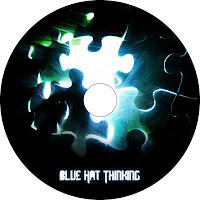 Due to not being able to fully afford the publishing of a small booklet within the slim-case of the release, I simply wish to thank my brother Alan, and Maarten Kleyne for their support, help and patience with working along side me on my project 'Blue Hat Thinking'. Alan, completing all of the bass guitar tracks for myself, as well as his definitive opinion on specific uncertainties within aspects of the music is something I want to fully credit him for. Maarten Kleyne who has worked very patiently with myself to mobilize the brushes in creating the excellent piece of cover art for the project is something I am very grateful for, and humble toward. Furthermore Kleyne being a part-time employed web designer, who undergoes creating album covers as part of side-project, hobby work shows the lustful talent he can produce artistically. Blue Hat Thinking project, (within Kleyne's portfolio).